Wow. That’s the only word that we think gives this recipe any justice. Chef Kristal’s Pan Seared Salmon, Coconut Rice & Mango Salsa Recipe is out of this world, and if the image above doesn’t make your mouth water, then we don’t know what to tell you! Read below and ‘wow’ your taste buds! 1. In a sauce pan, turn the stove on medium heat and drizzle the pan with olive oil. 2. Season the salmon with salt & pepper and pan sear on both sides for 5 minutes. 3. Drizzle olive oil into a pot and sweat the onions. 4. Add in the rice and toss the rice until it is coated with the onion and olive oil. 5. Add in the water, salt and coconut milk. Stir, cover with lid, and cook rice until the water has evaporated. 6. Chop up the red onion, mango, cilantro and green pepper. 7. Squeeze lime juice over this mixture and add 2 pinches of salt. If you’re looking for a tasty, low-maintenance & exciting dish, then Chef Kristal’s Shrimp & Grits is the way to go! Get your taste of some traditional soul food & read her recipe below! 1. Season shrimp with salt, pepper paprika, garlic powder and onion powder. 2. Heat sauce pan on medium heat and cook shrimp about 2 minutes on each side, or until pink. 3. Heat milk, season with salt, and then slowly add in the grits while constantly stirring. 4. Cook grits for about 20 minutes while constantly stirring or until smooth. 5. Once the grits are smooth add in the cheese and serve. Chef Kristal has delighted our taste-buds with her Purple Cauliflower Soup recipe! What better way to keep warm (and healthy) during the winter than with a yummy soup? Get Chef Kristal’s recipe below and meet the dish that will keep you wanting more! 1. In a sauce pan make a roux by melting the butter and stirring in the flour & combine until a white paste is formed. 2. Cook the roux for two minutes. 3. In a large pot on medium heat, drizzle some olive oil into the pot. 4. Add in onions and garlic and sauté for two minutes. 5. Add in vegetable broth and white cauliflower, and bring to a boil. 6. Once the broth has come to a boil, turn the heat down to low and scoop out 3 cups of this mixture and place into a blender. 7. Blend the mixture and add it back into the pan. Stir in the roux and cook until the broth is slightly thickened. 8. Add in carrots, purple cauliflower, celery, carrots and coconut milk. 9. Season with salt, garlic powder, paprika and onion powder. 10. Stir and cook until vegetables are tender, about 10 minutes. 11. Stir in parsley once vegetables are tender. Congratulations Chef Brian Mullins for being our Chef of the Month for June! See what cheesy concoctions he has been making in Miami! I was born in Long Island, New York. Where do you work and where are you based? I live and work in Miami. I have food trucks and two brick and mortar locations for Ms. Cheezious. It started as a food truck in 2010 and we opened our first brick and mortar on February 1, 2015 and our second this past April. What is your favorite kitchen tool in creating your masterpieces/dishes? My favorite kitchen tool is a good knife. It can become an expensive habit! What is your sharpest sense out of all the 5 senses? Hearing. In the restaurant industry we need to listen to people and our guests’ feedback. You can’t be emotional if someone doesn’t care for something. You need to be able to hear them and make changes. A lot of people don’t listen to what their customers have to say. What advice would you offer for aspiring chefs? Put in the time. Learn to take every opportunity presented to you when you’re not working. Ask to volunteer, to work with other chefs and offer to work at any event. Keep your head, down mouth shut and observe what’s going on around you. Be humble, pay attention and ask questions. What is one culinary tip every chef should know and perfect? Proper seasoning in general, but especially salt. It can change a lot of things so learn how to use it correctly. Good food means family. I grew up in a house where my mother, grandmother and aunts all cooked really well. My best memories are of big meals made from scratch in the kitchen that took hours or days, depending on what they were cooking. We all sat down together and ate really good meals. Now, my family and friends in the industry get together to create good meals and share those new memories. What trends do you see emerging in the near future? No one is really doing shakes in Miami, so we brought it back. We launched them a month or so ago. Florida is so hot; everyone wants a cold milkshake. We did a midnight snack shake – a chocolate shake with chocolate and peanut dipped pretzels, caramel popcorn and chocolate covered potato chips topped with whipped cream and sprinkles. For all the Miami people, we did a Pastelito shake with a guava cream cheese and vanilla base garnished with a fresh Pastelito on top. I want it to fit well and look good. Who doesn’t want to look good? I am big in the shoulders, so I need to be able to move. The coat needs to be moveable and breathable. I wear a lot of chef shirts. Being in South Florida, it is hot all day, every day and even hotter in the kitchen. Favorite ingredient to work with? Obviously, cheese. But besides doing grilled cheese, I really love smoking meats and BBQ. I like making pulled pork and ribs. Favorite City to dine out in? New York. I love every place. There are so many people from so many places around the world that you can get anything. It’s so rich in culture. If you want Mexican, someone from Mexico will make it or if you want dumplings, someone will make you authentic dumplings. I can always have one more slice of pizza as a snack in between meals too. I come home 10 pounds heavier from every trip! Best Dish you have ever made? Probably ribs. Like I said, I love smoking meats and barbecuing. You can take a long time to prepare them to impart a lot of flavor, and I create a good sauce. I can make them ahead of time and heat them up when I have friends over. I never have a problem having people show up for my barbecue. Place you eat most often on your days off? The Hillstone. I always know what I am getting. The food is good and the service is always great. Since I have so few days off, I want to have a meal served to me properly. I don’t want to leave a restaurant mad on my day off. Person you would most like to cook for? I would like to cook for José Andrés. He seems like a cool guy to hang out with. I would love to make Spanish food and tapas with him. He has always been a super nice guy when I have met him in the past. Like I said before, my best memories are good meals with family and I think cooking for him would be like that. What made you decide to become a chef in the first place? I started cooking at a very young age. Growing up, my mom was a single mom. We would fend for ourselves from an early age. When I was like 7, I would wake her up while she was sleeping to open jars. She was always in the kitchen cooking and making breakfast, lunch and dinner for everyone. After seeing my mom, grandmother and aunts cook, I wanted to emulate what they were doing. I would figure things out and make stuff that tasted good and get everyone sit down to have a good meal. What is new on your DVR? You would have to ask my wife. When I come home, I sit down and she puts on whatever she wants and I can just sit still finally. I don’t get much time at work to sit still. September eleventh. Just the mention of the date alone brings about feelings of anger and sadness to an entire nation of people. Just 13 years ago, one of the most tragic events in this country’s history took place, and many of us still feel the sting, even now. Nearly 3,000 people perished at the World Trade Center on that day, and their names will never be forgotten. The memorial that was built at Ground Zero draws about 10,000 visitors per day, whether or not they lost friends or loved ones on 9/11. We felt the pain as a nation, and we grieved as a nation. 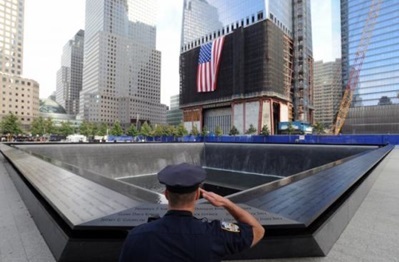 Now, 13 years later, we honor those who lost their lives in the attack by rebuilding as a nation. One World Trade Center, the tallest building in the Western Hemisphere, now stands as a beacon of hope for the citizens of New York and for the rest of the country. It opened its doors to tenants earlier this year, and is now a symbol of this great nation’s ability to get up and keep going after this unforgettable tragedy. Do you remember where you were 13 years ago when you heard the news? Share your story in the comments below.